The Fatal Fury series has seen more releases than any other game series in the Neo Geo lineup. And it's gradually gotten better with every release. But when SNK released Garou: Mark of the Wolves, the series took one HUGE step forward and finally became the game I think SNK had envisioned all along. With it's up-tempo fighting action and crisp control system, Garou: MOTW becomes one of, if the THE, best fighting games for the Neo Geo. 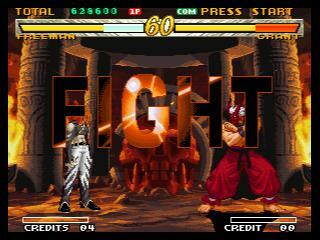 Bottom line is, if you like fighting games, and you should because you own a Neo Geo, then you should own this game. Period! I don't normally give games a perfect 10 because there is always the chance that a new game will come out and be better than the 10 I gave the last game. But with Garou: MOTW I just couldn't help myself. The fast action and super responsive control system in this game deserves the credit. But to fully appreciate this game you have to spend a little time with it. It's not a game that you just pick up and immediately appreciate what it's all about. The control system requires that you spend some time and learn the special moves and combos so you can see just how in-depth the fighting system really is. I think the one thing I loved about this game more than anything was how there never seems to be any lulls in the action. It's fast and furious from the time "FIGHT" appears on the screen until "KO" pops up. SNK really stepped it up a notch for this game and it really makes a difference. 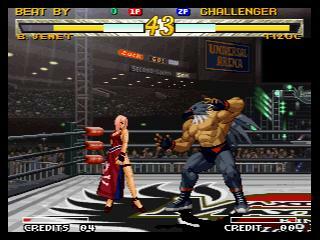 Garou sports some of the best fighting action you will ever likely see on the Neo Geo. When SNK put so much work into the Gameplay of Garou, they didn't stop there. Because the graphics in this game are the best I have yet to see on the Neo Geo. At times I stopped and wondered just how SNK was able to get these kind of graphics out of the old 16-bitter. Especially the boss stages. They are absolutely amazing. And because the game doesn't sport the now famous "Neo Zooming" the graphics always remain crisp and smooth. The screenshots just don't do this game justice. You really need to check it out in action to fully appreciate it. If SNK is in fact working on a sequel to this game, I can't wait to see if they are going to be able to outdo these graphics. I'll have to see it to believe it. They are just that good. 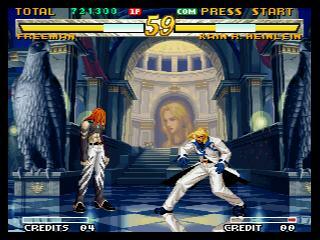 The sound and music in Garou: MOTW was the only area that I thought could have used a bit more work. But then again maybe I have been playing The Last Blade too much lately. It's certainly not bad. In fact it's pretty good, but with a game that got such a great makeover, I was hoping the music would have gotten an overhaul too. If you like the Fatal Fury style of music, then you'll feel right at home with this game. It's pretty standard fair. I guess I just expected more. Not bad, just not outstanding either. When they created the FUN category, they created it specifically for this game. Because this game is pure fun. I have spent over 12 hours playing this game over the past week and I loved every second of it. And as I said before, you really need to spend some time with this game before you decide if it's right for you. Because the real fun begins when you begin to understand how the fighting system in this game works. It's not like The Last Blade series that you can just pick up and start slashing and immediately get into. This one takes a little time. But once you pick the system up, you will be hard pressed to find a more enjoyable fighting experience on the Neo Geo or ANY system for that matter.